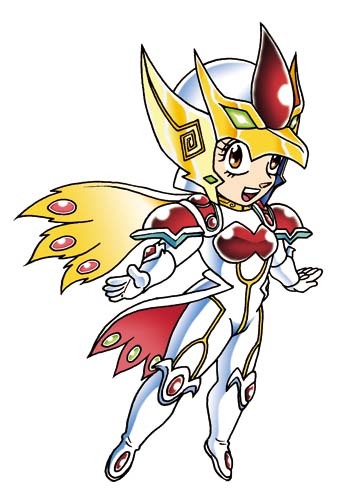 Might I point out that there's an anatomical error on her shoulder? That aside, awesome cover! Synopsis: After spilling ink on her manuscript and declaring that she’s had enough of this whole competition, Nagi indulges in some negative self-talk and proclaims that she doesn’t have a chance at winning anyway with only 3 days left. There’s really no time to re-draw everything at this point. Alice is apathetic about the whole issue and Maria smiles like an understanding mother, while Chiharu narrows her gaze sharply; trembling with anger. Nagi engages in more defeatist talk and even goes as far as to say that everything that she’s done so far has been in vain because there’s no way she could beat someone like Ruka. Nagi: Shut up, Chiharu. I'm being emo here. Maria moves in to play her part and comfort Nagi since she’s just given up, but Chiharu holds her hand out in front of her. Chiharu attempts to instill some fighting spirit in Nagi through several shonen anime references. This flips some kind of switch in Nagi and she goes into introspection and reflects on her life (no Nagi 360 elite this time). She realizes that this whole competition was never about Hayate nor winning against Ruka. It was always about her goal to “become something special” with her own hands. (Thus further reinforcing my theory about DAT APPLE). 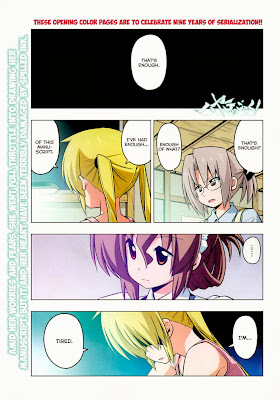 Snapping back to reality, Nagi suddenly comes to life and goes full shonen protagonist mode and boldly stating that she’d scrap the previous manuscript and re-draw everything from scratch because she is a genius who will sell a trillion copies of her manga (come to think of it, has Hata Kenjiro himself even made that mark yet?). Maria seems shocked by Nagi’s reaction and feels as if her role had been taken from her because Nagi snapped out of her depression without her being there to comfort her when she apparently “failed.” Alice sleepily walks away and tells Maria that her role as a mother is no longer needed. Lovely picture of Nagi here. With that said, I have mixed feelings about this chapter. 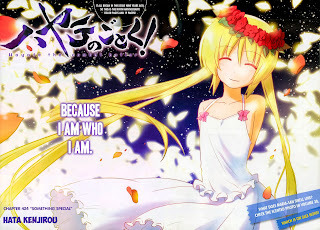 As a Nagi fan, a part of me wants to say that this was a really good chapter since it did wonders for her character development and it shows that she really has grown a lot as a person – even going as far as to say that she no longer needs Hayate and Alice adding on that Maria’s role as a mother is no longer needed. 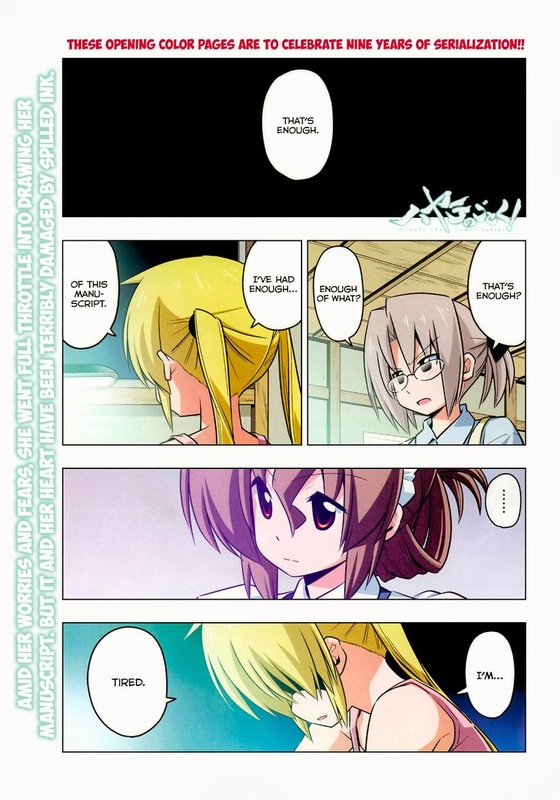 This whole arc – nay, even this whole manga can be said to be Nagi’s own coming of age story, as much as it is about Hayate and his misfortune. Furthermore, Chiharu finally does something useful in this chapter. As pathetic as Nagi deemed her shonen anime references to be, they did actually help alleviate her depression. Now for what I didn’t like: After the build-up in the last chapter, I find it to be a bit disappointing that Nagi can simply recover from her depressed state through some shonen anime references. I expected something more epic, dramatic or otherwise awesome like Kayura’s words of inspiration for her when they first met/when Kayura was first introduced in this manga. Still, it was a pretty good transition chapter over-all. Now Nagi’s in the right mindset to win this doujinshi competition again. Hata says that this is the climax of the doujinshi arc, so I believe we can expect the actual doujinshi competition to come in the next chapter unless there’s another unexpected plot twist incoming. Personally, I don’t think Nagi can win this one in terms of sales, but I get the feeling that she’ll have her moral victory – which is actually all that she’s after now, during the actual competition. One other thing worthy of note is Maria’s reaction in this chapter. In a way, she’s actually been a bit of an overprotective surrogate mother to Nagi and it’s understandable that she’d be in shock when she sees that Nagi no longer needs her and can stand on her own two feet now – in manner of speaking. Her aura of near-perfection has been broken (and not in a comedic way) in this chapter – as I believe this is the first time that she’s shown any actual emotional vulnerability. This is possibly an early foreshadowing for the next arc after the events of the future timeline anime (Heaven Is A Place On Earth, Can’t Take My Eyes Off You and the last two episodes of Cuties). Hata did say that Maria’s arc would be the last one and her reaction here could be an indication that this manga really is approaching its final arc. All the pieces are almost in place now as far as Nagi and Ruka’s rivalry is concerned. Still, it would be nice to know how Hayate feels about the whole issue pretty soon, since he’s still pretty oblivious to the fact that he’s hurting as many people as he helps – especially the ones who care for him the most. 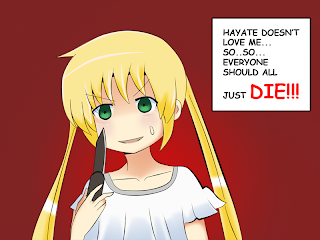 As a side note, there’s this Yandere Nagi fanart that I made and wanted to include in this post, but I decided against it coz Hata’s colored pages make my art look like scribbles :P.
Edit: you know what? I changed my mind. Have a Yandere Nagi. I understand where you're coming from, but disappointment is impossible in the face of that magazine cover and splash page. 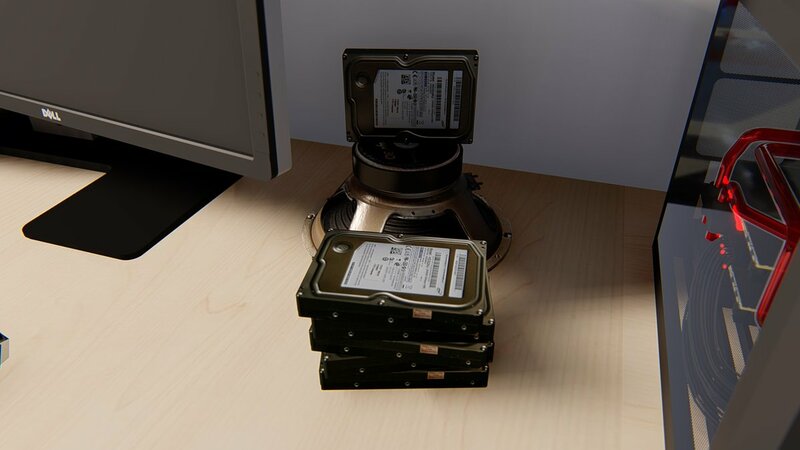 Impossible, dammit. It's definitely a great cover. I like the way they're holding each other and one can only hope that someday, Hayate might hold her like that without it involving some kind of rescue attempt or post-rescue attempt. Hey, I just want to say I love reading your blog, and seeing how you like the latest chapter. It's just so interesting and I anticipate it almost as much as the newest chapter. Awesome! I actually liked the previous chapter better, but this was one was fine as well. Having two consecutive Nagi-centric is definitely okay with me. I felt the anime Chiharu mentioned was just the spark. The rest of the motivation came from Nagi herself, which is why it worked for me.